As wibbly and wonderful as they are, I don’t often make cheesecake. Why, you might ask? I’ll tell you why. Because the cheesecakes I make for two people usually serve around 18 very hungry people and contain the same amount of calories as a whole hog roast. An hour down the line I can invariably be found guiltily checking my post-cheesecake-stuffed face in the back of a spoon to see if I’ve instantly ballooned. friendly cheesecake. Adapted from this BBC good food recipe, I liked the miniature theme – it’s always easier to feel satisfied after you’ve had your own whole version of something, rather than a slice of the whole with more winking at you from the fridge. These turned out really delicious. I’m not sure you would know they were low-fat without being told, but hey – I’m biased. But the lovely @princesspurling went back for seconds, and my boyfriend almost wept when he realised that between us, we’d eaten the last four of them – so I did something right. It’s also a super quick and easy recipe, so great to do at the last minute if you’ve got an occasion the next day. And at only 6 propoints each (or around 240 calories), by law, I have to eat them two at a time. If I knew much about wine (other than how to drink a bottle of it and stay standing), I’d say that these are like a good one – they only get better with age. 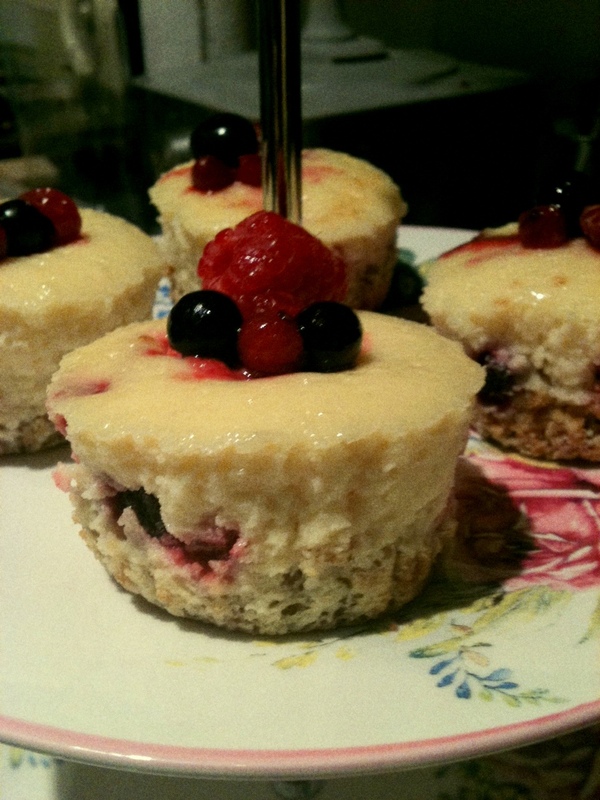 What are your favourite cheesecake recipes?! I’d love to know and drool, so do share – low-fat or otherwise! Preheat your oven to 180C/350F/Gas 4. Line your muffin tin with eight muffin cases. Take your anger out on the biscuits by popping them into a plastic bag and smashing them to bits with a rolling pin. Or whizz them in a food processor if you’re not that angry/have one. Melt your margarine and mix well. 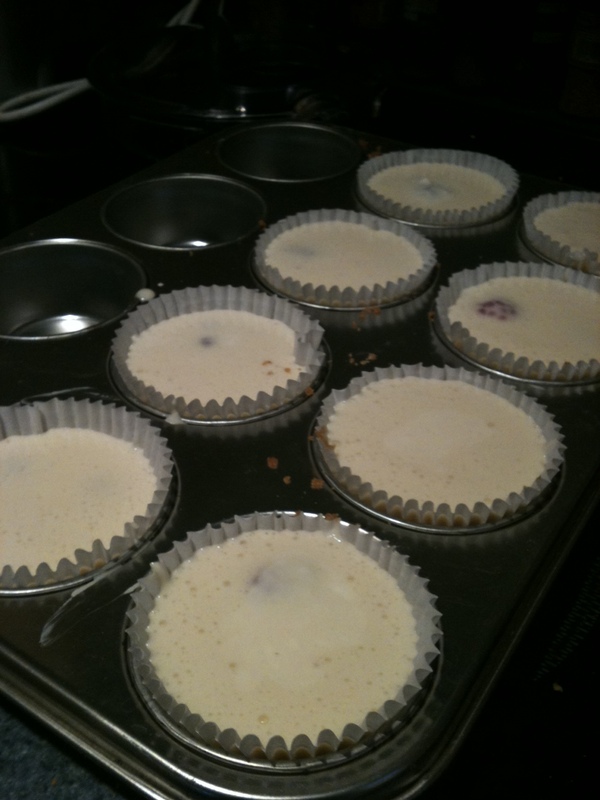 All ready to go into the oven – raspberries peeking out. Pop some into each muffin case and pat down gently to create your base. For the filling, beat the cream cheese in a bowl until smooth, then stir in the plain flour, caster sugar, vanilla extract, egg and egg yolk and soured cream and beat until the mixture is light and fluffy. I did this in my food processor with the whisk attachment ’cause I’m lazy and in awe of it’s snazzyness. Pop a couple of berries in the bottom of each case, and then spoon the mixture over the top, filling almost to the brim of each case. Bake for 20-30 minutes, until the filling is set, but you’ve still got a lovely little bit of wibble. Remove and leave to cool for around 30 minutes. Pop them on a plate and chill for at least an hour – preferably overnight. To serve, peel off the paper cases and decorate with some berries. If you’re feeling flash, add a bit of whipped cream and a cheeky wink.